Alternative to WPL Leaf Springs? Thread: Alternative to WPL Leaf Springs? Has anyone found a good material to make replacement leaf springs? Or any aftermarket upgrades? Re: Alternative to WPL Leaf Springs? Those retractable dog leashes with the plastic unit you hold and dog pulls it out and it zips back. They have a coiled up spring made of metal that I’ve used. Hope this helps. I ordered and used a 4mm pull start spring for my WPL and it was too stiff. The dog leash idea sounds like a better alternative. You can use a badge lanyard that retracts for the orlandoo hunter. But yeah the metal is the same type and tensile it appears. I saw your post about that. I tried a Traxxas spring for the pullstart on the .24 motors. The tension is perfect for a vehicle this size but the width is too narrow to drill the 2.5mm holes. It just leaves a hair on either side which would break on first use. To be clear, I have a 6x6 and I ordered the typical "see-saw" suspension that are all over ebay. 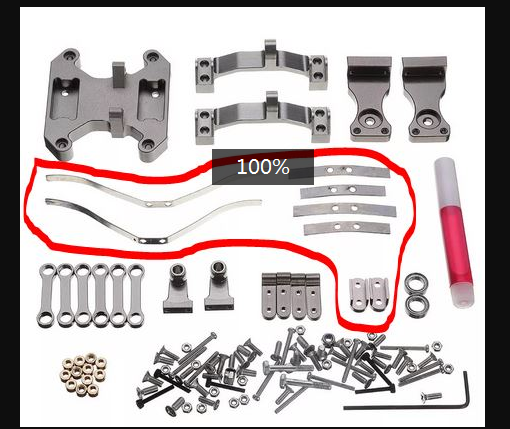 Beware that unless noted in the sale listing, the parts circled in red below are NOT included in ANY of the ones listed on ebay and the part is USELESS without these pieces because the stock truck does not have them and there is no where to buy the long spring separately (that I have found). 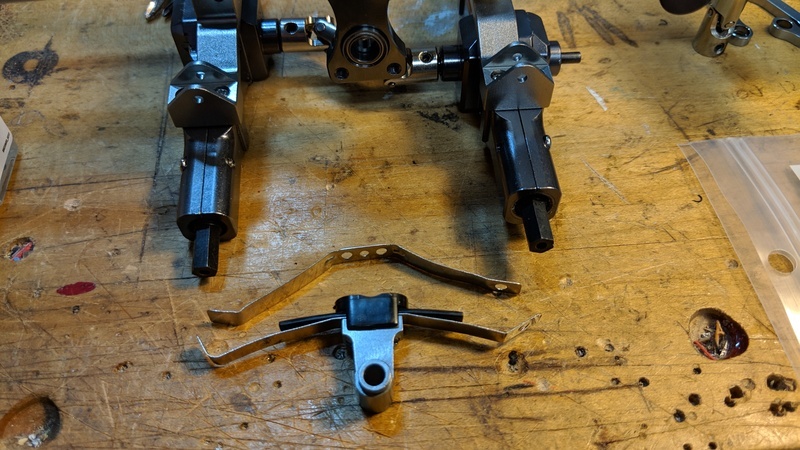 I finally found this picture showing the flat springs and shackle clamps(that are not included in all ebay listings for this part) on Bangood. Also note that Bangood has four different listings for this part, but only one of them has this picture. I sent that exact picture to Bangood support and asked if these parts are included and their answer was yes. Last edited by Shape_Shifter; 04-18-2019 at 12:59 PM. Reason: Navarro? I haven’t opened up but I’d imagine leash would be wider. I bought these but I have not installed them yet. They aren't cheap but it seems like it would take me a lot of time to come up with a good solution. I have some of those flat springs. They are good stock replacements but not an upgrade. Unfortunately, they are also not long enough for the 6x6 bogies. Im not sure if you can tell from the pic but they are nowhere near long enough. Here is a pic of the bogies. Also the stock JJRC 6x6 flat spring wich is the shortest (middle of pic), and the springs you list above are shown mounted on the swing arms at bottom of pic. It may be hard to tell in the picture but the spring perches on the axles are easily 10mm wider than the longest spring I have.